THE MESSY COOKER runs out of the cramped kitchen, flailing her arms dramatically in the air. Smoke fills the house. Sorry! Sorry! I do this every time! THE MESSY COOKER’S ROOMMATE rushes into the hallway, surprised by the ringing noise. Is the fire department coming? What’s burning? THE MESSY COOKER fails to vocally respond and instead throws a pillow in the direction of THE MESSY COOKER’S ROOMMATE. THE MESSY COOKER rushes back to the kitchen and frantically removes an over-charred rib-eye from an overworked cast iron pan. THE MESSY COOKER mutters to herself. THE MESSY COOKER stares in disbelief at the burnt meat lying on her teeny tiny cutting board. Google, you’re my only hope. THE MESSY COOKER finds an enticing article on her phone. She kisses the phone. My savior! Bonappetit.com! What a royal idea. Broil the other side of the steak. As THE MESSY COOKER sets her oven to Broil, THE SMOKE ALARM lets out its final call. THE MESSY COOKER’S ROOMMATE gingerly walks into the kitchen and looks at the blackened piece of food. I can’t even tell what that is. [dramatic pause] It is and was a steak. For my next trick, I’ll attempt to save the other side with a brilliant broiling technique. [yawns] Well, it’ll take more than magic to save that. I’m headed to bed. Try not to burn down the house. Maybe that’ll be next week’s blog post? THE MESSY COOKER’S ROOMMATE isn’t amused and walks back to her room. THE MESSY COOKER looks directly at the audience, a spotlight shines on the unsettling steak, mist creeps onto the stage. Heed this cautionary tale and avoid pandemonium. Yes, that was a pan pun. Use the below tips to adequately use a cast iron pan and not wake up your roommate/neighbors at 11 pm. THE MESSY COOKER stares off into the distance. Aye, there’s the rub…I knew I put it somewhere. Tis the season. If you’re using a brand new cast iron pan, be sure to wash it with warm water and let it dry completely. Then, add a tad of oil and heat on medium for several minutes. *Note 1: this coats the pan and “seasons” it so the pan becomes non-stick. *Note 2: I used a Staub cast iron pan, which may have different instructions than other cast irons pans. Rest your steak. Let your steak come to room temperature (let sit for ~30 minutes). This will help it cook quickly and uniformly. Turn up the heat. Set your oven to Broil. Add the oil to the pan and heat on medium-high until the oil is smoking. Tis the season (part two). Add salt and pepper to both sides of the steak before placing in the pan. Time it right. Cook the steak for 4 minutes or until a brown crust forms underneath the steak. Yes. Smoke will fill your house. But if your steak is really burning, remove it from heat!! Place on cutting board, brown side down. Broil and (hopefully not) toil. Place the steak back in the pan, brown side up. Add butter. Put in oven and broil until the butter is melted and steak is to cooked to your liking (~4-6 minutes for medium-rare). *Note: once again, this is a judgment call. Watch that steak to make sure it isn’t burning! Spoon the steak with the extra sauce that was left in the pan. It’ll be yumo for sure. * Extra tip: this steak is best paired with mashed potatoes and some red wine. You really can’t beat the classics, here. Also (extra cleaning tips, I know!) don’t let the steak juice left inside the pan go down the drain or sit in the pan. Move it to a bowl, then let harden. When you’re done devouring your steak, you’ll be able to easily throw away the now hardened meat juice. (You’ll save your pipes this way too). 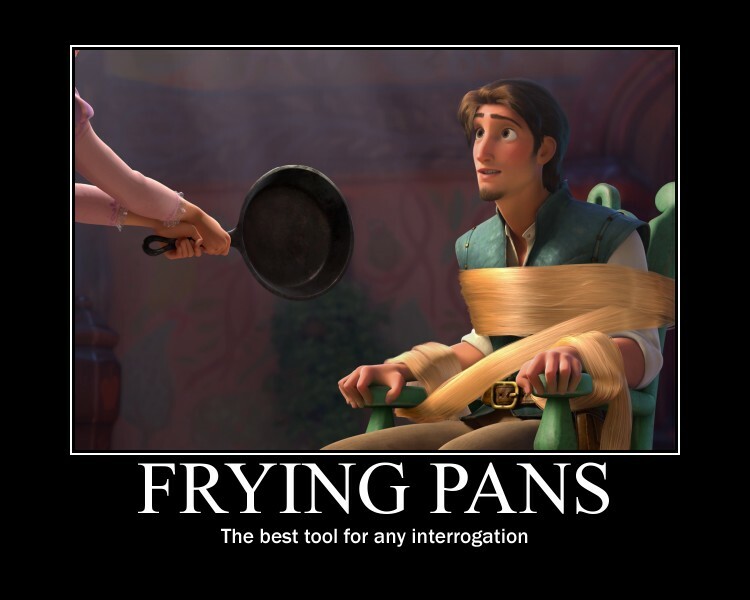 Want to see how Disney uses cast irons pans? CLICKSSSS. 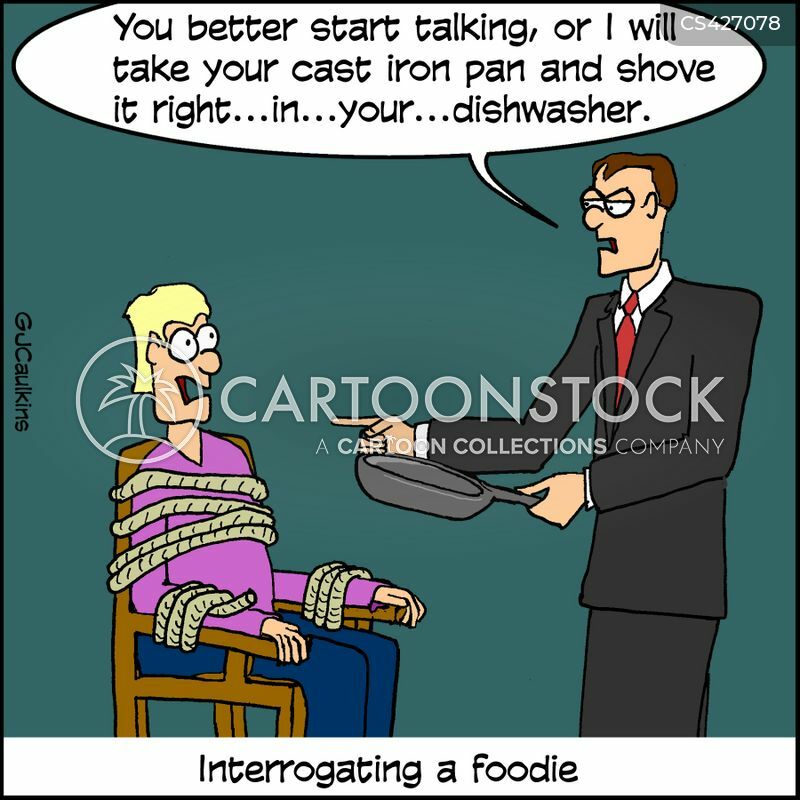 How about a really funny comic about cast iron pans? CLIKS. Bothered by how I spelled clicks with only a k? Know you aren’t alone.